The Availability tool lets people tell Shiftboard when, and in some cases for which workgroup (team), they can work. Not every organization will use the availability feature. For example, organizations that allow their users to pick up shifts won't necessarily need to track when people can and can't work because users are choosing when to work. Some organizations will allow people to add their own availability, while other organizations will restrict the ability to add or remove availability to managers or site administrators. All of these settings can be adjusted. 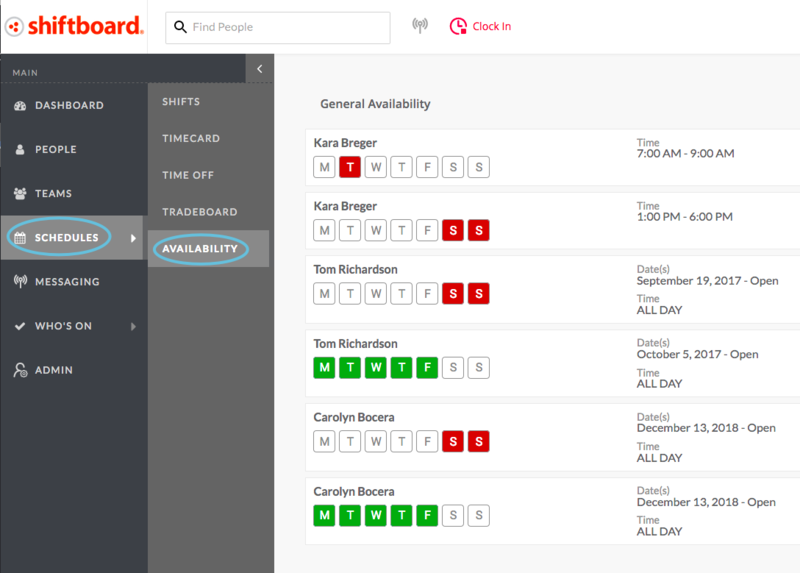 Shiftboard will automatically check availability entries when assigning people to shifts, so users don't need to check this information themselves. Managers and site administrators can override these availability entries if needed. People who are picking up shifts are always allowed to ignore their own availability. Indicating availability is different from requesting time off (see next section). Availability is different than time off. Availability is usually a set of generalizations to indicate when people can or can't work due to other commitments like work or school, or if people have specific guaranteed days off. Shiftboard's Time Off tool is designed to track requests for individual days off. Every Shiftboard site will be set up to either assume that everyone is always available or that everyone is always busy. Most organizations assume that people are always available. When using the Availability tool, Shiftboard’s customer success team will suggest the correct site setting. If the site setting assumes that everyone is busy, a person cannot be assigned a shift until availability information has been entered for them. If the site is set up to assume that everyone is available, users will need to enter information on when they are busy. If the site is set up to assume that everyone is always busy, users will need to enter information on when they are available. 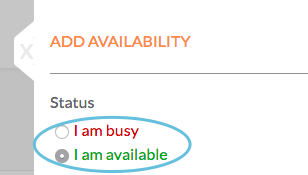 It's unnecessary to add a busy time when the site assumes that a person is busy or an available time when the site already assumes that a person is available. 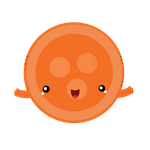 All availability entries should be either busy times or available times, depending on how the site is configured. The only time that a person might need to have both available and busy times is if the site is set up to assume that the person is busy and they've indicated that they're available on some days by adding general availability. But there's an exception to the rule where a person is busy on a specific day. Any busy time that they've entered will always take precedence over any available time.